I spent most of March Break in Barrie house/cat-sitting for my brother who spent the week in the much more exciting Montreal. My Bro's cat is an interesting dude who wants to be alone but doesn't like being left alone. It is a subtle difference and my presence was required to keep him company so he didn't pee on things he shouldn't. I also kept him fed and watered, gave him attention when requested, and removed a large quantity of cat barf from the carpet. I am a hero. Since I normally live in the country, I was excited for my cat-sitting trip to Barrie so I could do city things. When I think of city things, I think of walking and ending up somewhere interesting, quickly traveling to multiple places, and the freedom of getting treats late at night if so desired. I enjoy my country life of trees and nature, but I miss destinations on my walks (like coffee shops) and I long for sidewalks and 50km/hr roads. While in Barrie, I wanted to walk around and see things! So I made a plan. I wasn't just cat-sitting, I was going on an adventure. I mapped out stores downtown that I would walk to, explore, possibly buy things, and probably get some take out sushi to walk home with. I also mapped out places in the south end that I could drive to and walk around and explore. I'm not necessarily interested in buying things but I l love walking around and looking at stuff. The weather didn't cooperate. Last week it was nearing spring like temperatures and I forgot that it is still winter in Canada. So it was cold and rainy and then it was cold and snowy. The sunny afternoon walkabout I dreamed of is probably still a month away. Stupid winter! Also, my body refused to sleep properly. I'm often a bad sleeper when I sleep somewhere else, and this time was no different. My motivation to walk around and do cool stuff during the day was thwarted by my lack of sleep. But I didn't let it get me down. I'm in a new phase of my life where I'm trying to accept things as they are and not as I expect them to be. So I pretty much just hung out with the cat. And watched tv shows and movies. And ate ridiculous foods. I have stuck pretty well to my meal plan over the past few months, so I let March break be an excuse to eat whatever I wanted. Basically I just didn't eat vegetables for a number of days in a row. It was fun and super tasty, but I am happy to be back on my meal plan. 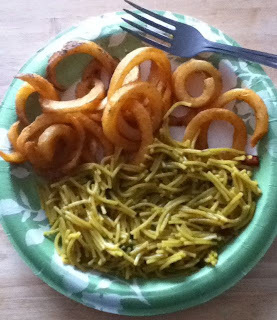 Sidekicks and curly fries for dinner - almost 100% vegetable free! I'm back in the country now, eating vegetables and thinking about going on a walk to nowhere. 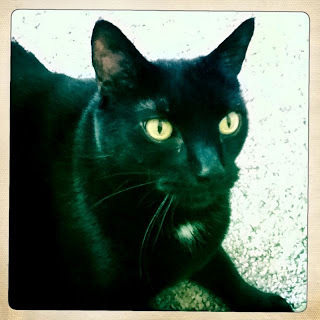 I'm also back with my own pretty kitty, who always gives me the best cuddles and love when I've been away. New Blog Design - YAY! !